*Assumes $500/minute in downtime and 30 minutes for a motor change. Bluffton Motor Works has created a unique testing environment, which lab engineers have dubbed the ‘torture chamber’, to replicate worst case scenarios for its washdown motors. By creating the torture chamber for testing, Bluffton has been able to test all advancements in a true working environment to assure that their motors are the best on the market. Bluffton Motor works has also created a test in which a HydroDuty Motor was submerged into a 55 gallon drum. The motor runs for three hours, then shuts down for thirty minutes. The cycle is repeated, 24 hours a day 7 days a week. The maintenance manager at a poultry processing plant had experienced motor failure repeatedly, because production lines are washed down several times a day with high pressure hoses. He asked Bluffton Motor Works to prove to him that their washdown motor really could survive any environment. They submerged one of their HydroDuty motors in an aquarium at the plant’s maintenance shop. Ninety days later, the motor was still running, so the maintenance manager installed it on one of the worst applications in the plant. Four years later, that same motor was still running that same conveyor. Bluffton Motor Works warrants that its products will be free from defect in workmanship and material at the time of shipment and will conform to the specifications published or agreed to between purchaser and Bluffton Motor Works for a period of one (1) year from date of installation but in no event beyond two (2) years from date of manufacture. 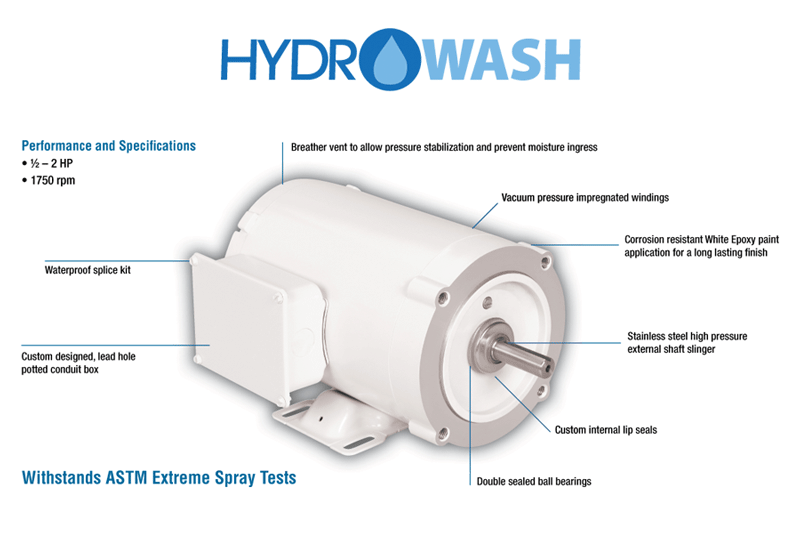 Specific to HydroDuty and Picker-Plus motors, this warranty will also cover all water-related motor failures resulting from typical sanitary washdown procedures for the aforementioned period of time. All warranty claims should be submitted through your authorized distributor. Motors requiring evaluation or analysis may be shipped freight prepaid to Bluffton Motor Works. Prior written authorization from Bluffton Motor Works is required before shipment. The warranty stated above does not apply to products that have been subject to misuse (including use in a manner inconsistent with the design of the product), abuse, neglect, accident or improper installation (including the failure to use the waterproof splice kit provided with the motor) or maintenance, or to products that have been altered or repaired by anyone other than Bluffton Motor Works or its authorized representative. 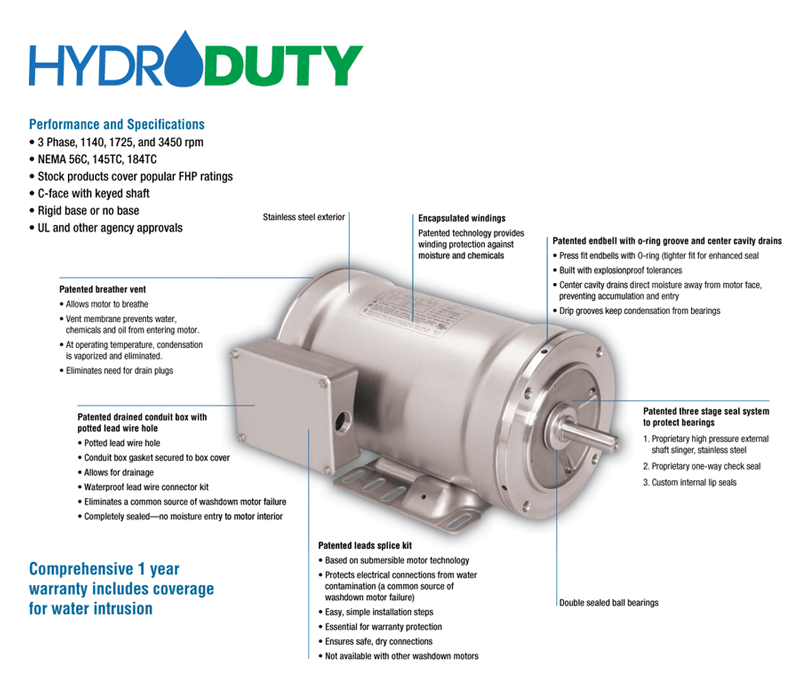 “We have close to 30 HydroDuty motors in operation right now. We started using the HydroDuty motor about four years ago. 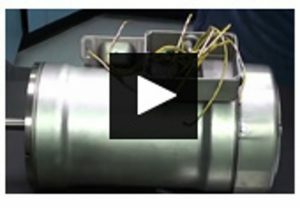 I had seen a demonstration of this motor, and we started considering them, primarily for harsh applications. For something like freezers, where the temperature might be -30° F during the day and 180° F at night, because of the sanitation procedures, a regular Baldor motor would only last about 2 days because of the condensation issues. We decided to try the HydroDuty motor, and we went from a motor lasting two to seven days to lasting six months to a year with the HydroDuty motors. That might not sound like a long time, but when you consider the extreme environment that these motors are running in, any other motor would last less than a month. “We use the 5 HP HydroDuty motor on our pumps. They pump our product and transfer them from the cooking process to the packaging process, moving the products through our system. The piping size is 3”. The Baldor motors were burning up every week or two on the pump applications. Water and condensation were getting in them, and we would have to change them often. We had about 15 pump set-ups and had to change at least one motor a day. We are getting about nine months to a year out of the HydroDuty motors. We have been real happy with their performance. “The HydroDuty motor comes with a little shrink wrap kit, and you need to make all of your connections inside the box on the motor. You have to slide the little shrink tubes over them with these gurney connections and crimp them. Then, you slide the shrink tube over the connections and heat it up to seal it to the wires. If you install them right and connect them right, you can actually run the motor underwater if you had to. Bluffton requires the motor to be installed correctly for warranty purposes. “The cost savings come from the life of the motor. Because it lasts so long, you save money. 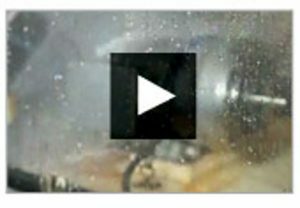 These motors are lasting ten times longer than other brands we have used. You really don’t have to buy that many each year when they last that long. I know of two that we had to replace—one was three years old, and the other was four. “Feather picking is a really harsh environment. The motor powers discs, which are filled with rubber figures and spin at 1000 rpm. The chickens run through a set of plates, and the rubber fingers de-feather the bird. Each reel runs at a 1000 rpm; they are all belt driven. There are approximately 16 per bank driven by one motor and a serpentine belt. “We first heard of the HydroDuty motors from a corporate email telling about plant trials with HydroDuty motors. We ordered a couple and put them on the cook side and had great success with them. They lasted many times longer than the other motors we were using. “After a visit to our plant by Bluffton’s reps we began using a low temperature version on a freezer application, again with outstanding results. 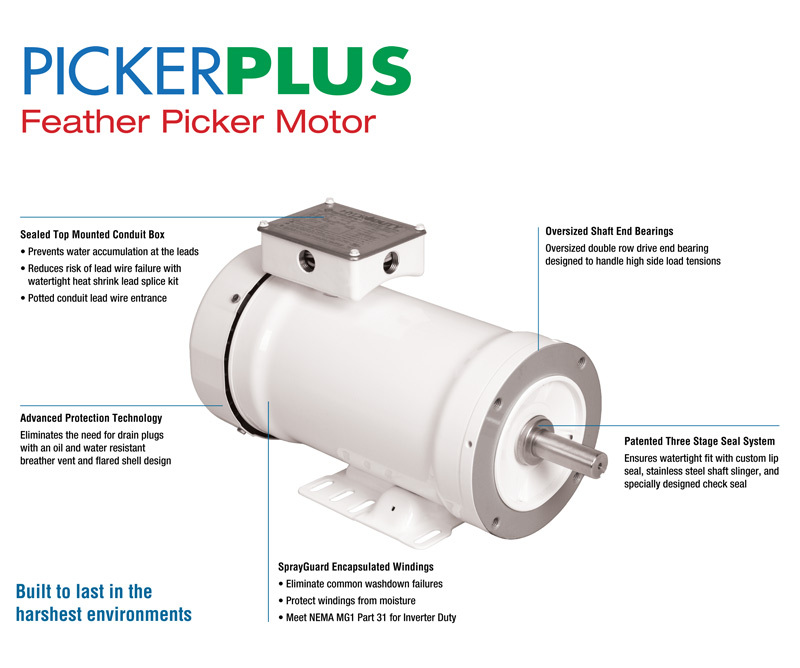 It has worked so well in this application the equipment manufacturer called asking about the performance of the motors on their equipment.